Whether you fish as a professional, a sportsman or just as a hobby, you will need the right tools to get great results. Among them are hooks, nets, baits, and reels. An important accessory that should never be left behind is a good pair of fishing pliers. Picking the right ones may not be easy, especially for someone who is just starting out. The matter is complicated by the fact that the market offers numerous options to choose from. The good news is that we have compiled a comprehensive guide to make the search easier. It reviews the best fishing pliers and provides additional information on how to identify a model that suits your needs. The Van Staal 6” Titanium Pliers Kit is built to be durable and strong without being too heavy, making it the Rolls Royce of fishing pliers. The pliers are made from titanium, making them virtually immune to corrosion. You can use them for saltwater fishing without worrying about damage due to rust. They are also lighter than models made from stainless steel and offer more sustainability as compared to aluminum or steel pliers. These pliers also come with ergonomic handles that are comfortable to hold. The jaws offer exceptional gripping power. Available in 5”, 6” and 7” sizes, the Van Stall Titanium Pliers have replaceable tungsten cutters with the ability to handle braided and wire lines. If you are the kind of person who is always losing things, you will appreciate the leather sheath and lanyard. They can even cut a hook if an emergency occurs. Overall, this kit offers pretty good value for your money. The Cuda CM18849-BRK Titanium Alloy Pliers are top of the line fishing pliers that can handle both mono and braid lines. As the name suggests, they boast a titanium alloy body that can withstand the harsh conditions of saltwater fishing. You won’t have to worry about your pliers corroding and being unable to function during their service life. Another major selling point for these pliers is the high leverage compound action, which offers more efficiency and makes your task easier. Cuda utilizes a visible full-tang steel construction to ensure increased durability and strength. The integrated tungsten carbide cutter is very sharp and strong. It can cut through wire, mono and braided lines with ease. You get a lanyard to ensure that you make back to shore with your pliers. The leather sheath is a nice addition, especially for someone who struggles with convenient storage of their tools. The Manley Professional Saltwater Fishing Pliers are equipped with tungsten carbide cutters that promise to cut through the toughest lines. They boast advanced construction with stainless steel and aluminum. This allows them to be extremely strong and rust-proof while remaining lightweight. You can be sure that your pliers will be serving your needs for a very long time. In addition to the aluminum and steel construction, these pliers have an advanced special coating that provides an extra layer of protection against the effects of saltwater exposure. They come with spring-loaded handles that reduce hand fatigue and allow for single hand use. You will certainly appreciate the small nose because it makes it very easy to grip fishing lines and remove small hooks. These pliers are offered with a free sheath and lanyard. You will always have the handy tool nearby when you need it. Additionally, you never have to worry about losing the pliers. Piscifun is a trusted brand in the tackle industry known for durable and reliable equipment. Available in five colors, their aluminum fishing pliers are designed to make hook removal much easier. It comes in two different lengths i.e. 7.1” and 8.46”. The first are split ring pliers while the 8.46” pliers are designed for saltwater use. The split nose pliers are short and have a stubbier nose while the saltwater pliers are heavy-duty with long noses. The distinctive hook at the end of the pliers separates and locks the split ring, allowing for ease of line assembly. A series of holes in the handles help reduce overall weight for better handling. Both Piscifun Aluminum Fishing Pliers versions are built with anti-corrosion, aircraft-grade aluminum. They have CNC cut handles that are lightweight and ergonomically designed to provide maximum comfort. The powerful jaws are crafted from stainless steel and coated with titanium for optimal strength. The pliers utilize tungsten carbide cutters to cut through the toughest backing lines, braided lines etc. You can replace the cutters if need be, which is cheaper than buying new pliers. These pliers boast a super bright LED bulb that comes handy when fishing at night. The tungsten carbide cutters can easily cut through any type of fishing line including monofilament and fluorocarbon lines. They are made of durable hardened aluminum alloy and will serve your needs for a long time. The 6.5 ounce lighted precision jaws are made from stainless steel and have a split ring tool that allows for easy assembly of the line. Another aspect we love about the MadBite Lighted Aluminum Fishing Pliers is the superior silicone handles. They are slip-resistant, comfortable to hold and provide a firm grip with wet or slippery hands. The handles are spring loaded to provide more leverage for hook removal, more force for crimping and cleaner cutting. This is another great pair of pliers that will prove a worthy investment for beginners and pro anglers alike. It features strong tungsten carbide cutters with the ability to cut through tough monolines and braided wire. What we love most is that the cutters are fully replaceable once they wear out, saving you the expense of getting new fishing pliers. Anyone who loses things easily will appreciate the inclusion of thermoformed pliers sheath. It is covered in 600 denier nylon and features a 36” Kevlar self-retracting tether reel. T-Reign offers two attachment options i.e. a stainless steel belt clip and two fixed loop straps. 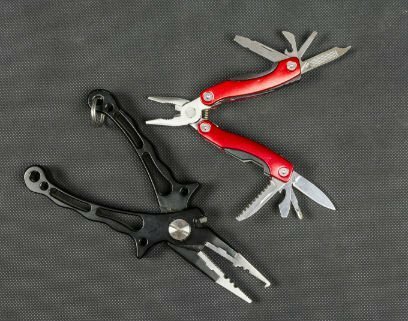 Both do a good job of keeping the pliers within easy reach and ensuring that you get back to shore with them. The pliers are made from aluminum and feature corrosion resistant stainless steel jaws with split ring opener and crimps. They are backed by a 5-year service policy while the sheath comes with a lifetime service policy. The F07 Black Crocodile Pliers by Booms Fishing boast strong construction with 430 stainless steel and titanium coating. They are corrosion resistant, especially if maintained well. The pliers feature differentiated serrated jaws that hold an object firmly and allow you to reach narrower places with ease. The professional sleeve crimper is specific to single sleeve barrels. There are five teeth, which provide individual pressure points. We love that the jaws leave very little gaps and such, one doesn't have to deal with wire crush. These pliers rely on tungsten carbide cutters and are available either as a split ring or straight nose type. If you are frustrated with flimsy pliers that bend when you try to remove the hook or can't cut through the fishing line, the Fishing Combo Set from Outdoor Gear will prove a worthy investment. It comes with everything you need to secure the catch smoothly. The fishing pliers have stainless steel jaws and a side sawtooth that provide a tight grip on the hook. They come with fully replaceable tungsten carbide cutters designed for opening split rings, and crimping leaders. They are made from CNC aluminum and have spring loaded handles with non-slip rubber grips. Also included is a fish gripper with a stainless steel grip head, double open jaws, and a 3-ounce nylon fiber body. It will secure and hold on to the heaviest fish with ease and thanks to its lightweight, maneuvering it won't be a problem. It allows for simple one-hand operation with an ergonomic handle. These are strongly made from aerospace aluminum for reliable and lightweight usability. They are designed for the ultimate control with patented Bubba Blade no-slip grip handle. The stainless steel jaws are bonded with titanium for the ultimate strength and durability. This makes removal of hooks a breeze. The pliers use cobalt tungsten cutters to ensure maximum cutting power. They are offered with a free sheath and lanyard for quick access when fishing. Designed for saltwater use, the CrazyShark Fishing Pliers offer comfortable handling with an ergonomic spring loaded handles. They are made using aerospace CNC aluminum, which ensures durability while keeping the weight low. There is 30% added thickness at the pivot area and the unique shark teeth structure provides extra gripping power. The pliers use tungsten material and 6D precise grinding blades to ensure quick cutting. Multi-function jaws can be used for split ring, crimp leads, grip line etc. One of the first considerations to make when choosing fishing pliers is the material. You need to make sure that your pliers are made from a material suitable for both freshwater and saltwater. Many models are made from stainless steel and while a good choice, it is important to ensure that the steel is coated for extra corrosion resistance. Most manufacturers opt to coat stainless steel with titanium, giving your pliers extra durability for saltwater. Aluminum is another durable material used to make fishing pliers. Look for models made of aircraft grade anodized aluminum as it offers optimal protection against rust and corrosion while ensuring maximum strength and efficiency. We always recommend lightweight pliers because they are comfortable to hold and don’t add too much weight to your fishing gear. The make your trip so much more enjoyable. Look for models that come with a protective sheath and lanyard, especially if you are heading out in a kayak and need to keep them handy. Some fishing pliers are extremely versatile and can be used for cutting all kinds of fishing lines. You can also utilize them to remove hooks and as a crimping tool for making joins. Fishing pliers with spring-loaded handles offer increased ease of use and are particularly handy if you use them frequently because they minimize fatigue. Aluminum may be incredibly rigid and strong but is also quite soft and such, wouldn’t hold up as an effective cutter and jaw material. Manufacturers of aluminum pliers often turn to other materials for these parts. Some use heat treated stainless steel and coat it with Teflon impregnation to prevent surface corrosion. It is important to note that most cutters and jaws of saltwater fishing pliers are designed to cut mono and braid lines. They will get blunt if used for cutting wires or tougher materials. This is an incredibly important feature since it minimizes hand fatigue. Spring loaded handles are very soft and ensure that you tire quickly due to repeated adjustment and readjustment of the grip. The springs provide a smooth and fluent motion while offering increased ease of use and comfort. Be wary of cheap, spin-off spring-loaded pliers that are extremely difficult to handle. Another benefit offered by springs is that they allow the handles to return to their open position. You don't have to worry about prying them open because it is done for you automatically. This is an essential factor to consider because the fishing conditions will if and how you catch the fish. Go for fishing pliers that can stand up well to extreme conditions. It should also be comfortable to hold and designed in a manner that doesn’t promote hand fatigue when used for extended periods of time. This will increase the chances of a successful catch. It is important to consider the type of spot you will be fishing at. Many fishermen prefer pliers with longer noses as it allows them to better deal with larger and stubborn fish found in saltwater.